Prevent the signs of aging and get radiant, youthful looking skin with Fraxel technology. Clear + Brilliant takes skin care to a whole new level, to not only correct unwanted signs of aging, but to give you the power to help prevent them. Clear + Brilliant helps you recover the glow of younger looking skin. 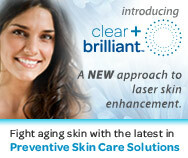 Clear + Brilliant is comfortable, fast, effective and affordable. Adding Clear + Brilliant to your bag of tricks at any age will not only prevent signs of aging but will also help you recover the glow, luminosity and smoothness you deserve. Renewed, ultra-soft and smoother texture. Naturally radiant and glowing skin. Improved tone, texture and radiance. How dow Clear + Brilliant work? I am in my early 20s. Is Clear + Brilliant right for me? No matter how old you are, sun exposure, environmental conditions, and lifestyle can contribute to lackluster skin. Whether you want to extend the young look of your skin or even need to reverse early signs of aging, Clear + Brilliant can help. The number of treatments is tailored to your concerns and skin care desires. In recent studies, consumers reported visible improvements after 4 to 6 treatments. Clear + Brilliant is very safe when used by a trained expert who will evaluate your skin and recommend the best course of treatments for your unique skin concerns.